Carnegie Council for Ethics in International Affairs announces “Information Warfare,” an important podcast interview series with full transcripts, hosted by Carnegie Council Senior Fellow Devin Stewart. Carnegie Council Podcast Series "Information Warfare"
With the growing power of surveillance technology & digital media, coupled with the prohibitive cost of all-out-war, political influence operations have become a more attractive tool of statecraft for great powers. These weapons of influence are being deployed in a battle for global public opinion. 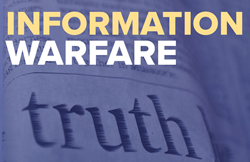 Carnegie Council for Ethics in International Affairs announces “Information Warfare," an important podcast interview series with full transcripts, hosted by Carnegie Council Senior Fellow Devin Stewart. "All countries—both friendly allies and rivalrous challengers—have always sought to influence one another politically," said Stewart. "With the growing power of surveillance technology and digital media, coupled with the prohibitive cost of all-out-war, political influence operations have become a more attractive tool of statecraft for great powers. These weapons of influence are being deployed in a battle for global public opinion about fate of the liberal order. Our 'Information Warfare' interview series aims to understand how these campaigns work, what their goals are, and how democracies can respond." Listen to these podcasts on iTunes or on the Carnegie Council website, where they are accompanied by full transcripts. Go to https://www.carnegiecouncil.org/programs/information-warfare and scroll down to program resources.